Central Michigan University geology professor Mona Sirbescu gets asked all the time if rocks people possess are meteorites, valuable rocks from space. "For 18 years, the answer has been categorically 'no' — meteor wrongs, not meteorites," she said in a statement. But this latest rock was the real thing — and valuable to boot. "I could tell right away that this was something special," she said of the 22-plus pound meteorite, described as the sixth-largest recorded find in Michigan and worth potentially $100,000. "It's the most valuable specimen I have ever held in my life, monetarily and scientifically," she added. David Mazurek says he took his doorstop to the university for examination in January, after seeing reports of meteorite pieces selling for thousands of dollars. Mazurek says the meteorite came with a barn he bought in 1988 in Edmore. He says the farmer who sold him the property told him it landed in his backyard in the 1930s. When looking at the rock on the barn's property, the previous owner matter-of-factly told him it was "a meteorite" and "it made a heck of a noise when it hit." After analysis, the space rock was determined to contain 88 percent iron and 12 percent nickel, which is rarely found on Earth. Most iron meteorites are generally comprised of anywhere between 90 and 95 percent iron, with the rest made up nickel, iridium, gallium and occasionally gold. 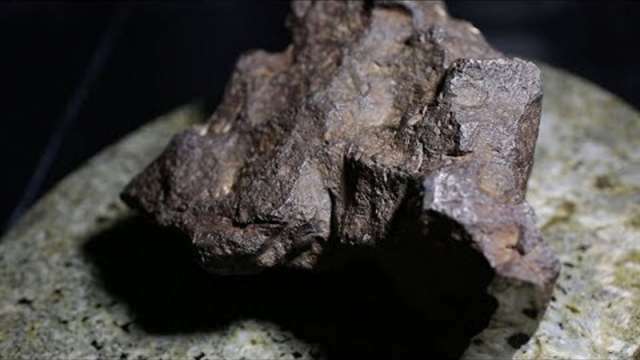 More tests are being conducted to see if the meteorite contains rare elements. Mazurek says that when he sells the meteorite, he'll donate some of the money to the university. Whatever amount he winds up donating, Sirbescu said her students, the university and herself have already been beneficiaries of the find. "Just think, what I was holding is a piece of the early solar system that literally fell into our hands," she said.